Changes by choice or easily changed if seat or back pad is damaged. 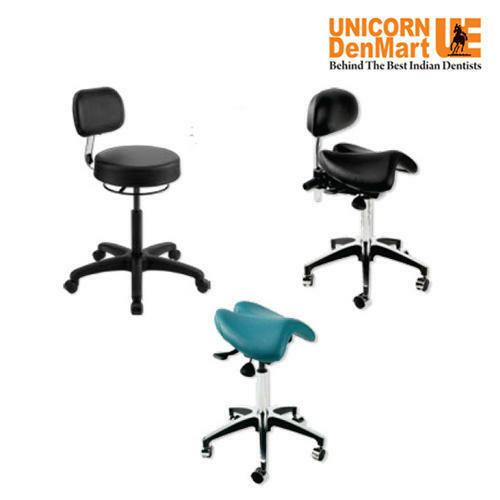 Established in the year 1995, Unicorn Denmart Limited, a progressive group, recognized as the pioneer and well established name in the field of Dental Equipments offering widest range of international products in Indian market place. The company offers various categories of Dental Equipments ranging from Dental Chairs & Units, Lasers, Scalers, Digital OPG Systems, Intra Oral Cameras, AERB Approved X-Ray Machines, Autoclaves, Digital Radiography Sensors, Handpieces, Dental Microscopes, Light Cures, Electrocautery, Bleaching Machines, Dental Cabinets, Physio Dispenser, Variosurge, Consumer Durables, Hygiene Range to name a few. UNICORN DenMart is serving its customers from over 22 years, offering international quality Dental Equipments with latest technology in Indian market place. Headquartered In New Delhi, India – UNICORN DenMart has reached every customer’s demand by expanding presence in PAN India Sales & Service Network through its own Associate Offices & Dealers across India. With 21 Showrooms & Regional Offices and more than 30 strong channel partners, the group has market its presence in almost all major markets across India. Since inception UNICORN DenMart is driven by performance ethics pegged on value creation for its stake holders. The products and services offer distinct customer solutions. The Group has maintained highest standards of practices, principles and corporate governance policies to ensure excellence in the performance at all levels.